Are advanced reservations required for the Play? While advanced reservations are not currently required, they are certainly recommended. Advanced reservations are required to tour the Holy Land, Backstage, and have lunch on days that the Play is not performed (year-round). Make reservations for this tour by clicking here! Yes, the amphitheater is handicap accessible. There is also a ramp that takes you all the way down to Row 20 in the amphitheater. 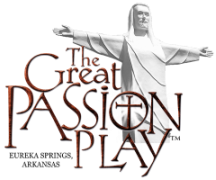 The Great Passion Play begins at 8:30 PM (7:30 PM after Labor Day). Seating begins at 7:50 PM (6:50 PM after Labor Day) after the pre-Play performances of the Potter, Shepherd, and Sculptor. Click here if you would like to know other times! Are there assigned seats? Do the seats have backs? We have open seating here at The Great Passion Play. Sit in the seat that you want! Some people like all the way at the top of the amphitheater, some like all the way in the front. Yes, our stadium seats do have backs to them! You are welcome to bring a cushion to sit on too! Can I take pictures of the Play? You can take pictures of the production as long as the flash is turned off. The Play is a copyrighted production, and we reserve the right to use any and all photos (and artistic adjustments) that you take without prior consent from you. No photos may be sold without written approval. If we have tickets to just the Passion Play, what time should we arrive? The gates open at 7:50 PM (6:50pm after Labor Day), we recommend that you come by then in order to get your seats and enjoy the pre-show performances. You should plan to come much earlier if you want to experience all of the events on the grounds including the Bible Museum, the Arts Museum, the Christ of the Ozarks, the Holy Land Tour, and all of the other wonderful events on the grounds. You can even make your trip to the Passion Play a 2-day trip. What is the schedule of events on the grounds? Click here to see a sample sheet of the day's activities for performances before Labor Day. Generally speaking, after Labor Day the times move up an hour. When is the Passion Play performed? 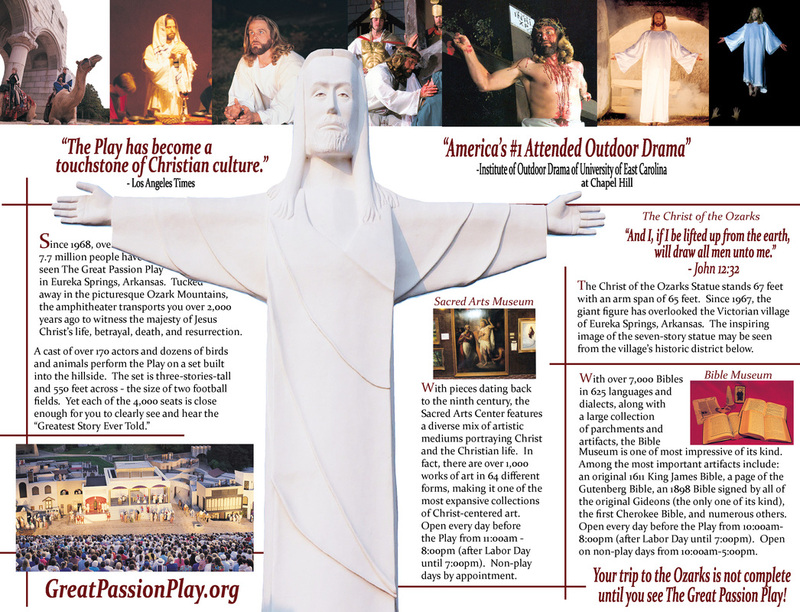 The Great Passion Play is performed from May until October. Performances are on Tuesdays, Thursdays, Fridays, and Saturdays during June and July. May, August, September, and October performances are always on Fridays and Saturdays and sometimes on Tuesdays and Thursdays. Check the season schedule page for specific performance information. There are also Holy Land Tours and Museums open all year long! To see a menu and pictures, click here! Is the buffet all you can eat? Yes, the buffet is all-you-can-eat. We do hope that what you take though, you actually do eat! Where is the Christ of the Ozarks memorial statue? The Christ of the Ozarks memorial statue is located on the grounds of The Great Passion Play. Drive all the way to the end of Passion Play road. Do you have drinking fountains on the grounds? Drinking fountains are located in both gift shops. We do not have an ATM, but we accept credit cards virtually everywhere on the grounds. Yes, hearing assistance devices can be checked out of the Blanket Room as you enter the Amphitheater. Is the Passion Play performed in the rain? Yes, the Play is performed in the rain and distant lightning. The safety of our guests is our first priority. Many people do travel long distances to see the Play, so every effort is made to complete the performance. What types of credit cards do you take? Do you allow animals at the Play or Holy Land? Service animals are allowed on the grounds (excludes Museums). Yes, lost and found is located at the Box Office. If you have lost something, you can also fill out this lost and found contact form. Can we visit the grounds in the morning and then leave and return for the Play in the evening? Yes, you can. But why would you want to? You can also use your tickets over 2 days. Are there other places to eat besides the buffet? Yes, we have concessions with things like BBQ sandwiches, pizza, nachos, popcorn, chips and hot dogs. Sensitivity Warning: Strobe, Pyrotechnics, and Smoke Effects are used in this production. If this page doesn't answer your questions, please feel free to give us a call at 800-882-7529 or email us.